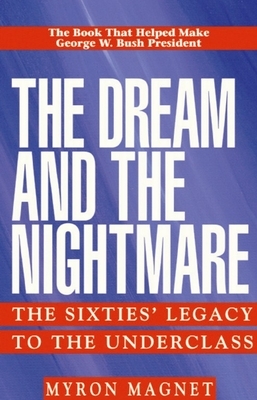 Myron Magnet's The Dream and the Nightmare argues that the radical transformation of American culture that took place in the 1960s brought today's underclass-overwhelmingly urban, dismayingly minority-into existence. Lifestyle experimentation among the white middle class produced often catastrophic changes in attitudes toward marriage and parenting, the work ethic and dependency in those at the bottom of the social ladder, and closed down their exits to the middle class. Texas Governor George W. Bush's presidential campaign has highlighted the continuing importance of The Dream and the Nightmare. Bush read the book before his first campaign for governor in 1994, and, when he finally met Magnet in 1998, he acknowledged his debt to this work. Karl Rove, Bush's principal political adviser, cites it as a road map to the governor's philosophy of "compassionate conservatism. Myron Magnet is the editor of CITY JOURNAL, the Manhattan Institute's quarterly magazine of urban affairs, and a former member of the board of editors of FORTUNE magazine. His work as a writer has covered a wide range of topics: American society and social policy, economics, corporate management, intellectual history and literature. Married and the father of two teenagers, he lives on Manhattan's Upper West Side. From Publishers Weekly: The legacy of the subtitle, according to Magnet, a Fortune magazine editorial board member and Manhattan Institute for Policy Research analyst, is "a liberal, left-of-central worldview" that, despite the intentions of the 1960s counterculture advocates, divides our society more fully than ever into Haves and Have-Nots. The sexual revolution and the focus on free "expressiveness" had the effect of holding "the poor back from advancement by robbing them of responsibility for their fate and thus further squelching their initiative and energy." The counterculture, as subscribed to by mainstream media, the federal courts and such figures as Ted Kennedy, befuddled the work ethic with idealistic notions of civil rights and fair wages. Finding a poverty of spirit in recent art, such as the fiction of Anne Beattie and Bret Easton Ellis, Magnet urges that we " stop the current welfare system, stop quota-based affirmative action . . . stop letting bums expropriate public spaces . . . stop Afrocentric education in the schools." Magnet offers many examples of societal ills but fails to make a convincing case that the legacy of the counterculture is the culprit. Copyright 1993 Reed Business Information, Inc. --This text refers to an out of print or unavailable edition of this title.